There are many types of research papers. In this article we’ll discuss two basic approaches. The first is the general research paper outline. It consists of the standard introduction, body, and conclusion. The second is the more rigorous research paper outline. It breaks down how a longer research paper should look—such as a thesis or dissertation with chapters and headings. 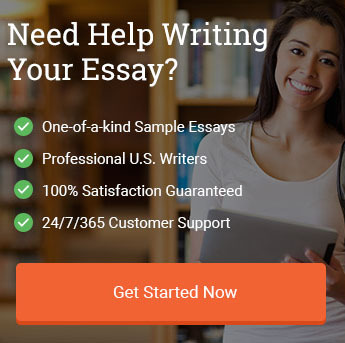 The general research paper outline consists of an introduction with a thesis statement, the body of the paper, and a conclusion with a recap of your main points. The introduction should not be any longer than 200-250 words. It should provide some background information as well as the purpose of your paper. Be sure to give an idea of how you will make your points or what sources your information is based on. The body should consist of at least 3 paragraphs. Each paragraph should focus on making one point to help support your thesis. Use transition words and phrases to link the paragraphs together and help your paper move from one idea to the next. The conclusion should be a succinct summary of your paper and the main idea. You can restate the thesis is new words and also provide a rundown of your main points. It’s also an opportunity to leave your audience with a final thought. You should not introduce any new ideas or arguments in your conclusion. a. Use a hook (an interesting fact or idea) or a good question to grab the reader’s attention. b. Give some background on the topic you have researched. c. Tell the reader what your paper will do/show—this is your thesis. i. Include some info on what sources you use. ii. Also give an idea of the process that your paper will take. a. Use at least 3 paragraphs to support your thesis (main idea). b. Each paragraph should focus on one unique point or idea in support of the paper’s overall purpose. c. Use transitions to link one paragraph to the next. a. Restate the thesis in new words. b. Recap the findings of the research paper. A longer research paper, such as a dissertation, will typically have chapters that cover a lot more ground on specific subjects within the report. Dissertations can be dozens of pages long. For quantitative research (such as in the natural or physical sciences), the following format is quite regular and is typically based on addressing some gap in literature. For qualitative research, the papers are less dependent upon existent literature and more focused on theoretical approaches. The following outline is best suited for quantitative or mixed-methods research, though it can also be applied to qualitative research papers as well. There are commonly 5 parts or chapters to the long research paper or dissertation. Not every paper will be for the same discipline, so the way in which they are set up will vary. However, typically, there are chapters for each of the following areas: 1) Introduction, 2) Literature Review, 3) Methodology, 4) Findings, and 5) Discussion. If you locate a scholarly article from an online database, it usually follows this same format—so you can have a look for yourself. An abstract is also commonly included and so is a reference page where all the sources used are listed. There are often as many sources used as there are pages and sometimes more! Let’s break it down and have a closer look at the research paper format for the longer report. We’ll look at each one individually and explain how they all work step by step. The title page comes first and it will be set up according to APA, MLA, Chicago or Harvard methods. (These are the most common styles but there are others, such as Bluebook—be sure to check with your professor to see which style you should use if you’re uncertain). The title page will be a standalone page that provides information about the author of the work (you) as well as the school and class for which it is written. The proper format for this can be obtained Purdue OWL—see some of their examples here. The abstract is a brief synopsis of the paper that follows. It should explain what the subject is, what the thesis is, which methodology is used, what the findings are, and what conclusions are drawn. The average abstract is about 150-200 words long. For a quantitative study, the literature review is one of the most important parts. Your research will be guided by it and your study will attempt to fill some gap in the literature—some problem that has not yet been addressed. If you’re conducting a qualitative study, the literature review will serve more of a background filling-out purpose. It will help explain your theoretical approach. You’ll want to use as many scholarly sources as you can find to make your literature review extra rich and meaningful. The methodology section should be used to explain the exact method used to collect data for the research paper. If the study is a meta-analysis of literature, for example, you would explain how you selected the literature reviewed for the paper—what keywords you used, how you filtered articles out, what you assessed them for, and so on. If you are surveying subjects, you would describe how you found your participants, what your survey consisted of, and how you analyzed the findings. The chapter on findings is where you tell what you found when you analyzed the data you obtained in your research. You do not give any opinions or present any conclusions in this chapter. Here you simply say what was revealed when you looked at the information you retrieved. The next chapter is where you would discuss what the findings mean. In this chapter you would talk about the meaning of the results from the previous chapter. Here is where you offer up opinions or conclusions regarding the findings. You can discuss how they compare with your hypothesis or attempt to explain them in the light of your theoretical framework. You can also offer recommendations for future research based on the findings and the conclusions you draw from them. a. In 1787, Americans had to decide whether they wanted a central government or a loose federation of states, with each state its own government. b. The Federalists argued for a central government. c. The Anti-Federalists argued for state governments. d. This paper will examine the history of America in the 200+ years that have passed in order to assess which side of the debate has been proven correct. a. The Federalists argued that states would fight among themselves and get the Union entangled in foreign wars without a strong central government to keep watch over them. i. This has obviously not come true. ii. Just the opposite has happened: the central government has had the Union entangled in foreign wars almost non-stop for at least the past century. i. The Constitution essentially served as a means of handcuffing local authority, small business, and rural farmers. ii. The keys to government were handed over to the Federal Reserve in 1913: they were given the power to print the nation’s currency and lend it to the government at interest. c. Needless to say, the Federalists favored central banks. i. Central banks have been the main catalysts for economic crises unlike anything ever seen. ii. Today’s zombie economy is a direct result of central bank intervention and unconventional monetary policy. iii. The Anti-Federalists opposed central banks and believed states should be stewards of their own coin and able spend money as they saw fit. a. Today’s problems are the direct result of Federalist ideas. b. The Anti-Federalists were correct to warn Americans about what would happen should the Federalists gain power. What they have predicted has come true. Topic: Is social media a good tool for business? a. Problem Statement: Social media is a revolutionary new Internet tool that allows people to connect and share information instantaneously. There is little research available, however, on whether it can be used to support business aims. b. Purpose Statement: This paper will use the survey method to obtain data for business managers about their social media usage. c. Hypothesis: It is hypothesized that most business managers will use social media but that the advantage of doing so is not very well documented. d. Limitations: This study is limited in terms of time and scope. It was only able to interview six business managers, which is not a significant sample size. e. Chapter Breakdown: The following chapters include a literature review, a methodology section, a chapter on findings, and a conclusion in which the findings are discussed and recommendations made. a. Studies that discuss business use of social media will be reviewed and discussed in this chapter. a. The survey method used will be described. b. How participants were chosen will also be discussed. c. The survey questions will mentioned and included in the Appendix. d. How the survey questions will be analyzed should be described as well. a. Findings from the survey should be described here. b. Tables and graphs can be included to help the reader visualize the data. c. Any measurements described in your methodology (such as correlation) should also be included. a. What do the findings mean? b. Provide an explanation of why the results show what they did. c. Offer recommendations for future research—how researchers can build on your study. Use your introduction wisely. Whether you are writing a longer research paper or a shorter one, the introduction is where you provide some background on the subject you will be writing about. Let the reader know up front what your position is, how you will make your points, and where your paper is heading. Load up on resources. The more references you have to show support for your point, the better your research paper will be. Use the body of your outline to go into the particulars of your research subject. Use one paragraph per topic in a shorter research paper, or one chapter per area for a longer research paper. Go over the main points again in your conclusion or discussion section. Offer recommendations for further research if there is space in your paper to do so. Provide an abstract—a brief synopsis of your research—in roughly 200 words (half a page). This is a must for longer research papers but not always needed for shorter papers. Always follow the rubrics you are given by your professor! Your outline is like a road map, so use it as a reference for when you go to write your paper! Always construct an outline before you begin writing. Produce an outline that is comparable to the scale of your paper. Revise your outline as needed; if you do more research, let it reflect in your revision. Be mindful of your sources when drafting your outline: plug them in where needed and be sure to cite them when finished! If you need further assistance on how to write a research paper, check out this article. "How to Write a Research Paper Outline (2 easy approaches)." Aceyourpaper.com. Student Network Resources Inc, 20 August. 2017. Web. 20 April 2019. Student Network Resources Inc. "How to Write a Research Paper Outline (2 easy approaches)." Aceyourpaper.com. 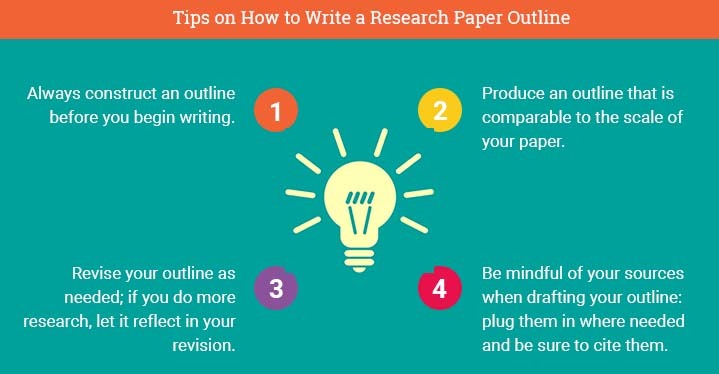 https://www.aceyourpaper.com/essay-writing/research-paper-outline/ (accessed April 20, 2019).